We spent last night in the ER waiting room at New York Methodist Hospital. Mostly it was a very long and boring night of waiting, but, this being New York at night and all, there was some drama to disrupt the monotony. The waiting room was packed with people. All of the chairs were taken and several people were standing. We had seats near the center of the room. I was reading a book when I heard the sound of something splashing on the ground. About 4 feet away I saw a man with a tired look on his face, a large cup of tea in his hand and vomit flying from his mouth. 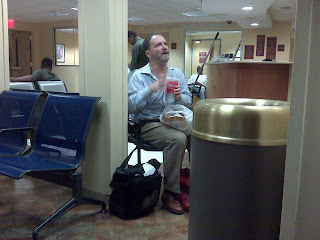 The people seated next to him got up and moved immediately. Those of us in the vicinity stayed put as we processed what had just happened, but only for a moment. The man started throwing up in rapid but regular intervals, like he had a strange case of hiccups that ended in a spray of barf. As if on cue, everyone within 10 feet of the man stood up and walked away. The man continued puking for a couple of minutes. His expression never changed. He didn't make any attempt to find a trash can or to make his way to the restroom. Nobody working at the hospital seemed willing to do anything more than make an announcement over the PA system, "Environmental to the ER waiting room. Environmental." At this point about a quarter of the seats in the waiting room were empty. From time to time, new arrivals would take some of the seats that were vacated. Then they would quickly realize why those seats were empty as they noticed their feet in the vomit. I watched this happen 3 or 4 times, but I'm a little surprised that New Yorkers fell for this so easily. One of the shared experiences that New Yorkers have is that of the suspiciously empty subway car. Sometimes you're waiting a long time for a train to arrive. The platform is crowded with people. When the train arrives you notice that all of the cars on the train are packed with people. Except for one car. If you're not paying attention you might think this is your lucky day and make your way to that car. You enter the car and the door closes. Then you realize why the car is empty. If your luck continues, the reason is the air conditioning is broken. If your luck has run out, there is a homeless man passed out in his own feces. Yes, this has happened to me. Not the "passing out in my own feces" part. Anyway, my point is that I'd expect New Yorkers to be paying more attention to their surroundings. But apparently some people are not bothered in the least by such filth. One man decided to eat his dinner amidst it (see picture). I fall for that every. single. time. I think it's that I momentarily believe NYC is finally rewarding me for all the crap I put up with to live here. You mean Methodist on 7th ave & 7th street? If you do than you're the loser for even going there. I've only gone there if I have an open bullet wound.... its the only way to get seen within the 1-2 hour mark. I didn't realize Methodist had that reputation. It's not like it's Park Slope in 1985 and you're waiting to see a doctor because Danny Bo fell off his roller skates. But now I know.